Juan Baltazar is the Regional Director of the Western Region. 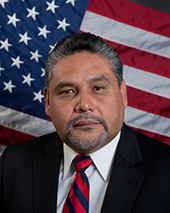 Mr. Baltazar began his career with the Bureau of Prisons in 1993 as a Correctional Officer at USP Lompoc (CA). He served in positions of increasing responsibility, including Senior Officer and Senior Officer Specialist at ADX Florence (CO), Lieutenant at FMC Carswell (TX) and FCI La Tuna (TX), and Special Investigative Agent at FCC Forrest City (AR). Mr. Baltazar also served as Senior Intelligence Designator/Specialist and Chief of the Sacramento Intelligence Unit before becoming Associate Warden at FCC Oakdale (LA). Subsequently, he served as Warden at FCC Allenwood (PA), FCI Otisville (NY), and USP Canaan (PA) before being selected as Complex Warden at FCC Tucson (AZ). Mr. Baltazar assumed his current position as Regional Director for the Western Region on September 30, 2018. As Regional Director, Mr. Baltazar oversees the operations of 19 Bureau of Prisons secure facilities, including four detention centers and three high security penitentiaries. There is also a government-owned but privately-operated correctional institution within the Western Region. Mr. Baltazar is also responsible for the oversight and management of more than 5,000 employees, and the custody and care of approximately 20,000 inmates. Before joining the Bureau of Prisons, Mr. Baltazar served in the United States Air Force. He has been a member of the Senior Executive Service since 2016.